Dye Sublimation Printers : Print pictures from your mobile phone or any digital medium within seconds using "PixelPAC Kiosk", employing the latest automatic dye sub printer technology from Japan. 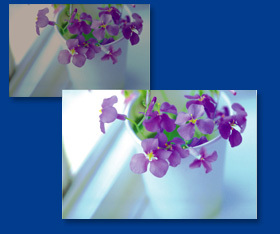 Customers can print 4"x6" pictures in just 9 seconds using the simple touch screen software. 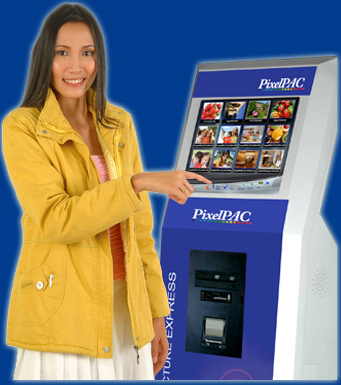 The PixelPAC Kiosk turns a small space and investment into big profits. Efficiency and Privacy PixelPAC provides privacy and security to it's customers by automatically deleting files from the kiosk computer once printing them.The kiosk has a modern, attractive and sturdy design. High resolution 17" Touch Screen 17" wide touch screen with side shield to block glare and provide privacy. Front End Media Loading Convenient "Front Loading" system provides quick and easy paper changes. Pictures printed from mobile phone Print images from mobile phone, or PDA via Bluetooth, infrared or media card. 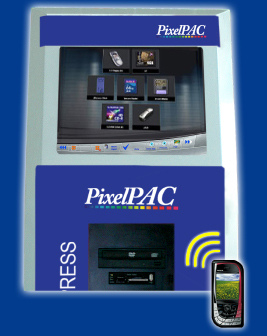 Works with all digital mediums PixelPAC Kiosk is designed to use most digital mediums; Digital card, USB, Flash Drive and CDs. 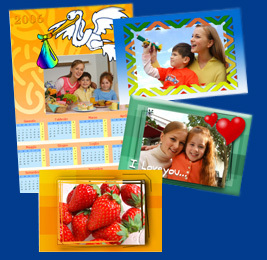 Variety features The software comes complete with variety of fun features such as graphics, fonts, colorize or sepia tone, frames, cards or calendars. Adjust or retouch the picture with ACE Auto Color Enhancement I2E technology to make pictures bright, detailed and properly exposed. More sizes and more packages Make custom sizes, package prints and adjust mobile phone resolution for better prints. Long lasting pictures Manufactured with latest technology from Japan using anti-moisture resin coated paper to prevent fading and protect the picture surface.